We started making our own pectin in Florida when we stumbled across a recipe for it. Oranges were in abundance and super cheap. In fact, they were so cheap we would squeeze our own orange juice every morning. Agghhhh, how we miss those inexpensive bags (and we do mean BAGS) of oranges. Living in Ontario…it’s just not affordable (any time of year) to be squeezing your own juice daily. We’ve only made orange pectin once but will include it for those of you who have access to inexpensive oranges. Personally, it seems like a bit more work but when the price is right it may be worth it. Note: it will also have a slightly different texture to the apple pectin and may even be a bit bitter. Discard seeds. Scoop out membrane and some of the white pith from the oranges and pack tightly in a 2 cup measure. Using a food processor blend oranges, lemon juice and 2 cups of water. Allow to stand for 4 hours. Add 2 more cups of water and allow the mixture to stand at room temperature over night. Next day, bring mixture to a boil and simmer for 10 minutes. 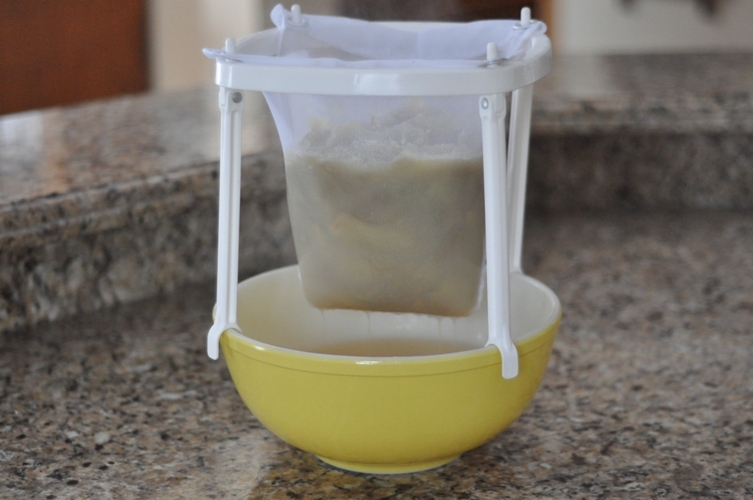 Using a fine mesh sieve or jelly bag, placed over a deep bowl, pour mixture and juice into the sieve to collect the juice. You should have approximately 2 cups of liquid orange pectin. Pour the liquid pectin into a clean jar and refrigerate for up to 2 weeks. Normally, we make pectin from tart apples, like Granny Smiths. We usually make it in large batches but the same ratio applies for whatever amount you desire (1 pound of apples to 2 cups of water). Make what you need to use right away or make larger batches and process to store for when you want to make a preserve that requires additional pectin. Wash apples well and cut into 1/8ths or small cubes, removing the stems and blossom end. Note: do not remove the skins, seeds, or cores as they are naturally rich in pectin. Place apples (skins, seeds, and cores), water, and lemon juice into a large preserving pan. Bring to a boil over high heat, cover, reduce heat and boil gently for 30-40 minutes, stirring occasionally until the apples are completely broken down. Using a fine mesh sieve or moistened jelly bag, placed over a deep bowl, pour mixture and juice into the sieve to collect the juice. Let drain for 2-4 hours. Note: Some recipes ask you to let this drip over night. It is completely up to you but does not affect greatly the quantity of overall juice collected. This juice collected should measure approximately 6 cups. 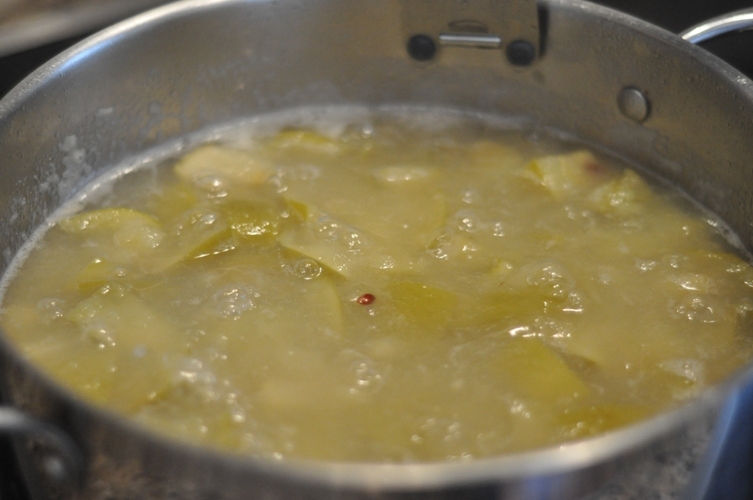 Pour the apple juice into a clean preserving pan and bring to a boil over high heat for approximately 5 minutes. It will reduce slightly. Ladle or pour apple pectin in clean sterilized jars. Refrigerate for use within 2 weeks, freeze to use within months or process in hot water bath from longer shelf life. See below. Please Note: Apple pectin can be processed in a hot water bath. Ladle hot apple pectin in clean sterilize 250mL or 500mL jars, leaving 1/4″ headspace, wipe rims, remove air bubbles, top up liquid (if necessary), and place sterilized lids and rings on adjusting so that it is finger tip tight. Process for 10 minutes. 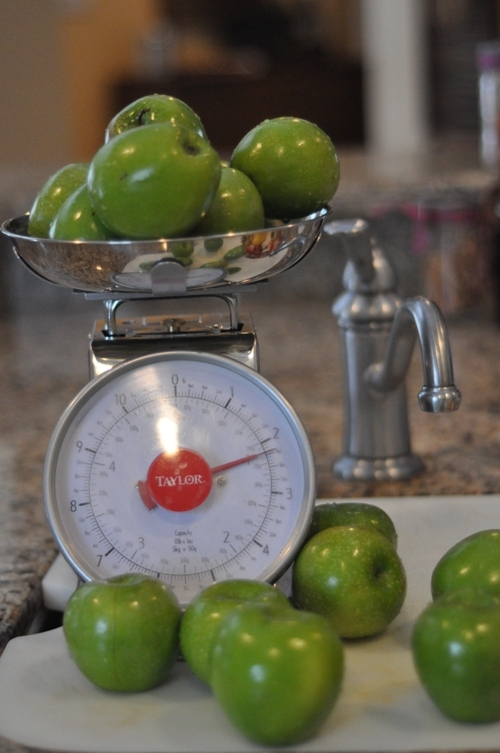 The homemade apple pectin had a pH reading of 3.36 with a correction of + or – 0.02. We will spend a day making several batches of apple pectin following the above recipe. When we have two batches of juice collected we will boil them together and prepare for water bath canning. We will ladle our pectin into 500mL (pint) jars which is 2 cups of liquid pectin because the majority of our recipes call for the use of 2 cups of homemade pectin. Our friends swear that our jellies and jams taste better because of the homemade pectin…really we’re not so sure but we enjoy the whole process and wouldn’t do it any other way. You can use the remaining pulp for apple sauce or apple leather. For a change, we’re going to try making the apple leather. ← That Bloody Marmalade Tastes So Good! How would you use this–do you have a recipe or proportion that you use it for? For example, how would you use it for raspberry jam? In raspberry jam we just add homemade sauce from about 5 tart green apples to every 4-5 cups raspberries. But, a good rule of thumb when using low pectin fruits is about 1 cup homemade pectin to about 3 pounds of fruit. Most of the jams and jellies in Christine Ferber’s book Mes Confitures call for 2 cups homemade pectin. It’s made a bit differently. We like to make and process several batches to have on hand when we decide to make a preserve that requires a bit of extra help. I do have a small apple tree, and though I’ve never made standalone pectin, I made all my raspberry jam last summer with apples added to the berries rather than pectin. I used the recipe from the Joy of Cooking and it worked like a charm and tastes lovely. I understand quinces work beautifully for this as well. Yes, that’s what we do for raspberry jam as well…we just add some tart homemade apple sauce but you could use the homemade pectin too. Yes, you could make pectin out of quinces and probably currants too! We just make it out of fruit that is available and inexpensive. I’m the founder/moderator for Punk Domestics (www.punkdomestics.com), a community site for those of us obsessed with, er, interested in DIY food. It’s sort of like Tastespotting, but specific to the niche. I’d love for you to submit this to the site. Good stuff! Could you use Meyer Lemons? Yeah, probably. You may taste the bitterness more than in the oranges but they are high in pectin and should work. Everything is worth a try (at least once)? Great resource! Thanks for writing it up! I live in Florida. and my sister and her husband have 500 acres of groves. So I have lots of free to me oranges!!! I make orange marmalade and grapefruit marmalade and use a small amount of pectin because following traditional recipes makes them both very bitter, requiring lots of sugar. I just juice the oranges, use very little sugar, and a little pectin. But I am interested .. does it taste bitter? Do you use it for everything, sweet jellies too? Have you tried freezing it? I’m gonna have to try it!!! We’ve only made the orange pectin once and we don’t remember it being bitter. Yes, we use it for everything…sweet jams and jellies. We haven’t tried freezing it as our freezer space is more limited than our shelf space but you probably can. Recently we used the apple pectin in the beer jelly and the apple lavender jelly. We are trying to see if we can get on a grove while down in Florida this winter. When I was young we used to go to the local grove most days to buy our family supply of fresh citus. And, often we were allowed to pick too! It’s such a fond memory and now that Matt and I are so into canning it would be really nice to be able to pick the oranges that will go into the jars. I always have tons of pectin left from our meyer lemon Marm production and I just knew it would be the answer to strawberry and the other soft berry jams…just looking for a little validation. Thanks! I think your blog is fantastic and I really appreciate your straight forward technique and explanations. Do you think the orange pectin would be safe to can? I have an orange tree in the backyard with so many oranges this year! I would like to try this pectin to use throughout the year. That’s awesome to have so many oranges! I’m excited about the oranges and look forward to seeing what’s available when we get to Florida. I always recommend airing on the side of caution but I imagine the orange pectin would probably be high in acid and therefore have a low pH safe for water bath canning. It is aways a good idea to be safe and we strongly recommend testing for pH. We use a digital pH Meter so we are able to check to be sure that our recipes are well below 4.6 (which is what is safe for water-bath canning) but you can purchase pH strips at Macherey-Nagel. They have multiple test bars for color comparison and test in .5 increments. One of our readers uses these and says they buy the 0.0-6.0 ones and use 4.0 as a safety line (even though 4.5 would technically be sufficient). Thank you for the reply – I figured I wouldn’t be able to can the orange pectin – but it was worth asking anyway. I will freeze some instead. Thanks for your blog – it is a great resource for all of us newbie canners.